By December, rain and the darkness of winter blankets the Capital Region. Berries hang like rubies from the darkening limbs of the Arbutus. Storms shawl the coast with salt spray. Songbirds have migrated to their southern homes. But as the days shrink to their shortest and the Salish Sea takes on its jade-green clarity, a dark pulse of fish are gathering in the deeper waters of our coast, waiting for spring. Biologist Jacques Sirois would like to see these fish – Pacific herring – return to their pre-1960s population, a restoration he argues would have cascading effects not just on marine life, but on how we live in and think of this region. 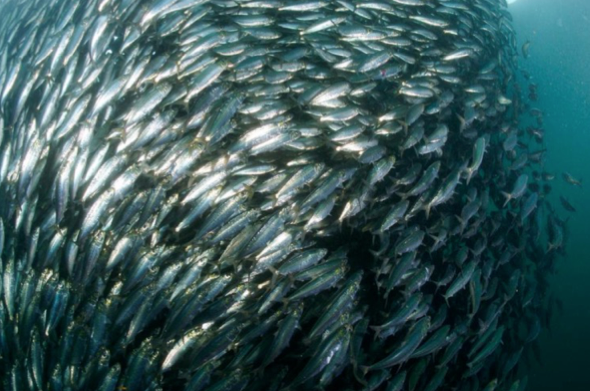 Pacific herring, a schooling fish found in the Pacific from California to Japan, have been called a cornerstone or foundation species for their key role in marine ecosystems. Herring and their eggs help sustain sea birds, black bears, wolves, eagles, fish and marine mammals. Fingerling herring, born in our region’s harbours, bays, and shallow waters, leave their spawning grounds in early fall for the open ocean, where they follow currents and travel in schools until full maturity – about three to five years. I met with Sirois at his home in Oak Bay, but he didn’t stop at telling me about herring. 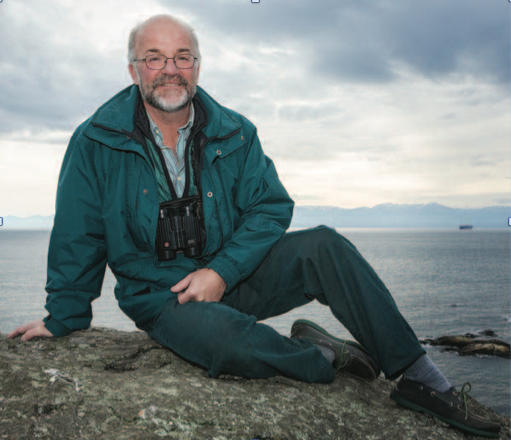 A fast-talking transplant from Quebec City, Sirois is a passionate volunteer warden for Trial Island Ecological Reserve and Chair of the Friends of the Victoria Harbour Migratory Bird Sanctuary (GVMBS), which stretches from Gorge Inlet to Ten Mile Point in Saanich. He also works as a lecturer in the polar regions, tying nature and culture together for those enthusiasts who travel vast distances to visit research stations and icebergs. Sirois wants residents to think bigger when considering the south coast’s future. Here at home, he points out, there isn’t even a sign celebrating Trial Island’s status an ecological reserve. Our marine and terrestrial ecosystems are, in his view, “the best coastal environment in Canada,” but will only remain that way through concerted efforts. Integrating a plan for herring restoration with cultural heritage and sanctuaries for species at risk would allow the region to coordinate planning. This, he says, could happen with creation of a UNESCO Salish Sea Biosphere. Through the Cattle Point Foundation, he argues that a Salish Sea biosphere would provide opportunity for balanced interactions between humans and nature and champion the area as a model for sustainable living, cultural heritage and ecological diversity. Sirois leans in at his dining room table to emphasize his points, “To Lekwun is to smoke herring.” The Lekwungen, ancestors of the Songhees Nation, used this fish as a staple. The Tyee argues that herring may have sustained First Nations as much or more than salmon. Their bones, previously undetected in coastal archaeological surveys because of their size, date back to catches over 10,000 years old. “This is ground zero for a paradigm shift” he argues. Herring used to school so thickly in Victoria Harbour and Gorge Inlet that the water would turn black. In 1960s, and then again in the 1980s and 2000s, populations plummeted. Overfishing, creosote pilings and pollution took their toll; in 2014 and 2015 the Department of Fisheries and Oceans allowed fisheries openings in the Haida Gwaii, West Coast Vancouver Island and Central coast regions. The Heiltsuk, Haida and Nuu-chah-nulth succeeded in halting both years’ openings based low herring numbers. A return of the herring, Sirois argues, would allow species like migratory birds to rebound. In the last decade there has been a 70 per cent decline in coastal bird populations. Worldwide, populations of marine birds, mammals, fish and reptiles have declined by 49 per cent since 1970. Some species, like tuna and mackerel, have seen drops as high as 74 per cent. Sirois wants to see revival of the GVMBS, marked as a protected area for migratory birds in 1923, through enforcement and education. The sanctuary protects, on paper at least, shorebird species, many of which are constantly on the move. Loons, grebes, plovers and terns use the GVMGS shores in winter as feeding locations on the way to their breeding grounds. Sirois argues that the GVMBS was ideally situated. Birding BC keeps track of unusual species seen by residents. This year’s spottings included the Golden eagle, Brown pelican, Cattle egret, Pacific golden-plover, Long-billed curlew and Wandering Tattler, many seen within the boundaries of the sanctuary. The region’s richness, says Sirois, presents an ideal opportunity to create a biosphere. But it may takes some changes to how we currently live in it. For instance, one of the biggest obstacles to enforcement of the bird sanctuary might not just be development or pollution, but the species that accompany people to those shores. Sirois would also focus on a domestic pet. “We have a dog problem,” he sighs. “Our beaches and our rare plant habitats that are used as dog parks, this is highly questionable. We have many wild versions of Butchart Gardens, but better. We need to treat them like we do those gardens.” The Dallas Road walkway features a two kilometre off-leash area, where dogs swim on beaches and romp along shorelines. Signs exist in parks like Dionysio, on Galiano Island, warning of nesting oystercatchers and other seabirds, but disturbing the established Dallas Road ecosystem of dogs and their owners may prove a hard sell. Sirois names off local natural areas – Uplands Park, Cattle Point, Dallas Road, the Oak Bay archipelago that could constitute core conservation areas in the Salish Sea Biosphere. “Right now, we still have all of the ingredients here,” says Sirois. “The bald eagle has returned. The northern elephant seal returned, where they bred on Race Rocks in 2010.” As a recent success story he cites Howe Sound, where the Squamish Stream Keepers began a herring reintroduction program in 2004, covering creosote pilings with environmental wrappers to protect roe from contamination. The eggs began surviving. Within ten years, he tells me, Orca, salmon and birds returned to what had been an industrially decimated area.